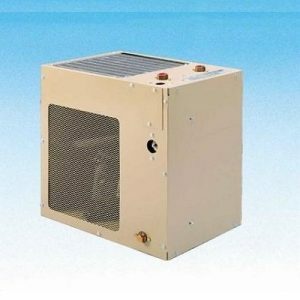 In addition to our wide range of water coolers, drinking fountains and bottle fillers that come in various shapes and sizes, we also stock under sink water chillers. These are perfect for spaces where traditional cooler units are impractical. 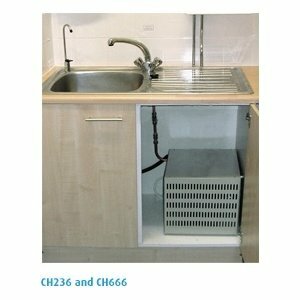 Under sink chillers are ideal for home or office environments where space is limited, or if you simply want your water dispenser out of sight. These compact units fit neatly under kitchen counters where they are connected to your main water supply and fitted to the faucets they feed. They can also provide water to wall-mounted drinking fountain by being installed behind the unit. 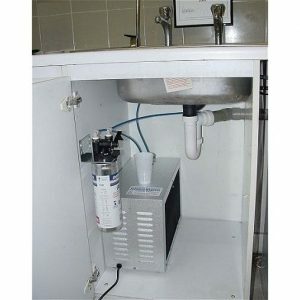 Regardless of where you choose to connect your under sink unit, you’ll have a constant supply of chilled water. You won’t have to worry about running out, waiting for bottle deliveries or storing bulky containers in the fridge. 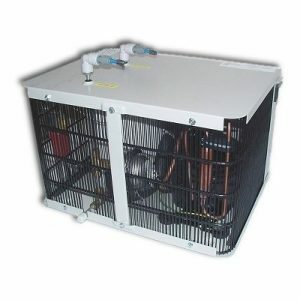 Browse our range of under sink water chillers below and give us a call on 020 8855 3333 to discuss your requirements.